In summer green nail polishes wouldn't be my manicure colour of choice, however in recent years there have been some lovely green offerings that I couldn't resist picking up. Green nail polishes are now something I consider and view as a nice alternative from the super brights I love. 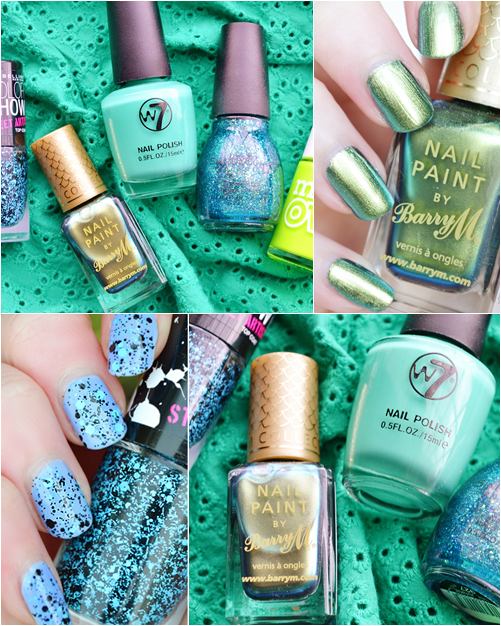 Here are my top 5 green nail polishes that are all purse friendly at under £5. Maybelline Street Artist Top Coat "Alley Attitude"
This isn't technically a green nail polish as the top coat is made up of turquoise and black matte glitter pieces but I feel this is the most perfect top coat for over any green nail polish.The top coat changes nails into something more interesting and unique. Definitely one of my most favourite matte glitter top coats. Barry M Aquarium Nail Paint "Arabian"
A beautiful duochrome here that's an amazing mixture of green and golden tones. Such a perfect nail polish colour to wear in summer as the light really reflects the nail polish, constantly giving different tones of green and gold. W7 Sorbet Nail Polish "Pistachio"
W7 nail polishes may be over looked due to being a cheaper brand however I personally cannot fault them and highly recommend giving them a go if you spot a W7 stand. Pistachio is a lovely cream green that is neither too neutral or too bright with a super smooth finish. Just perfect. Sinful Colours Glitter Nail Enamel "Nail Junkie"
A nail polish fit for a mermaid! This is possibly one of my favourite glitter top coats that transform nails into a beautiful sea of glistening blue and green tones. For a light shimmery jelly effect I like to apply two coats to bare nails however this truly comes to life when paired with a darker green base (nail swatch above). Models Own Polish for Tans "Flip Flop"
Models Own are great for bringing more unique shades to the high street and this is a perfect example. This acid lime green shade is an idesl nail polish to show off a tan but I can confirm that it also looks great against pale skin. Definitely one for fingers and toes on hot summer days! 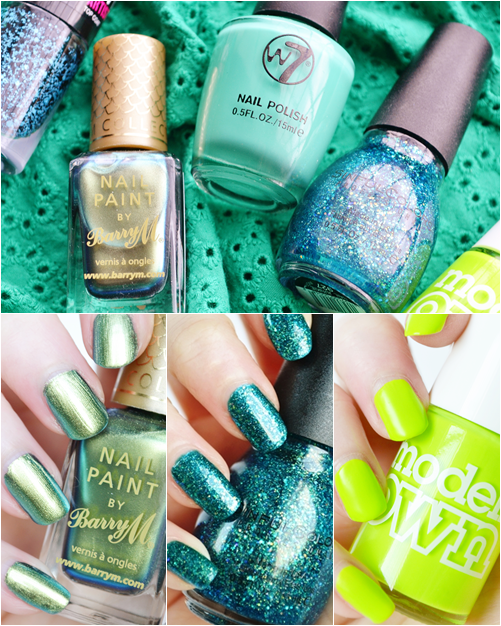 You can see the rest of my green nail polish collection here! What is your favourite nail polish colour to wear in summer? Mine has to be anything that glitters or any super bright pink.